Commercial banks have consecutively lowered the value of the US dollar against the Vietnamese dong during the final days of 2018, helping the USD/VND exchange rate close the year under control. The exchange rate at commercial banks dropped sharply over the past three days, pushing the rate below the threshold of VND23,300 per dollar, the lowest level since September 21 this year. On Friday alone, banks depreciated the dollar against the dong by some VND15-40 per dollar. Vietcombank cut both buying and selling rates by VND20 per dollar, listing the buying rate at US$23,170 and the selling rate at VND23,260. 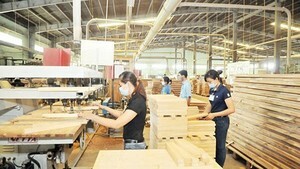 The rates at BIDV went down by VND30 to VND23,165 for buying and VND23,255 for selling. At Techcombank, the buying rate decreased by VND20 to VND23,140 per dollar and the selling rate by VND15 to VND23,255. The decline was notable especially when the central bank consecutively raised the daily reference USD/VND exchange rate. 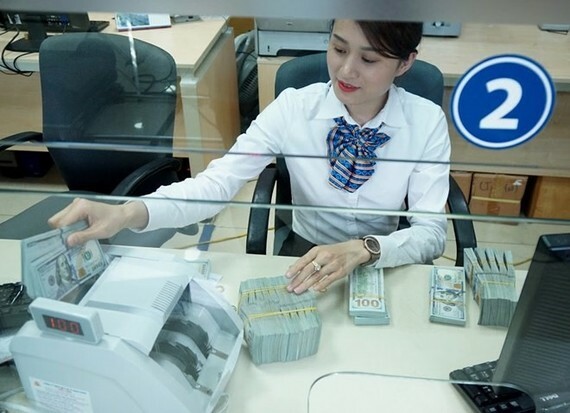 On the last working day of 2018, the State Bank of Vietnam (SBV) continued to adjust the rate upwards by VND20 to VND22,825 per dollar. With the current trading band of +/- 3 per cent, commercial banks were allowed to sell the dollar at the cap of VND3,509 and the floor rate of VND22,141 on the day. During the day, SBV’s transaction office also kept the buying and selling rates of dollars to commercial banks unchanged from the previous day at VND22,700 and VND23,439 per dollar, respectively. According to data from the National Financial Supervisory Commission (NFSC), the dong was relatively stable against the dollar in 2018, with the central bank’s daily reference USD/VND exchange rate increased by about 1.5 percent compared to the beginning of the year while the rate listed at commercial bank increased by about 2.8 percent. The commission attributed the slight increase of domestic exchange rate to international factor of the US dollar index rising about 5 percent against the beginning of the year and up 9 percent compared to the bottom in February 2018, as well as domestic inflation pressures. However, the rise was slight thanks to positive support from the country’s balance of supply and demand of foreign currency, NFSC noted. Reports from Bao Viet Securities (BVSC) also showed that the dong is among the currencies that have stiff resistance against the US Federal Reserve (Fed)’s lending rate increases, and Vietnam is the only country in Southeast Asia that has not taken its cue from the Fed. According to the NFSC, the stable exchange rate has contributed to the country’s macroeconomic stability and inflation control, thereby strengthening the confidence of foreign investors in the Vietnamese economy. NFSC also predicts that the pressure on the exchange rate will be reduced in 2019 as both domestic and international factors tend to be more favourable than in 2018. Specifically, the US dollar will possibly not increase much or even weaken while domestic inflation will be controlled at about 4 percent since the global commodity prices do not increase much; and the pressure on the exchange rate will decrease. Though believing the pressure on the dong in 2019 will not be as high as in 2018, BVSC analysts said prudence is needed and the central bank will likely maintain tight liquidity policy in 2019, with the dong injection into the market in 2019 to be not as much as in the first half of 2018. The SBV protects the value of the dong by reducing liquidity of the banking system, and the bank will maintain its strict liquidity management to counter Fed’s lending rate gains in 2019, BVSC analysts said.